Ship Repair in Whangarei is at the top of the North Island of New Zealand, convenient for making hull repairs on international ships before or after navigating the open seas, as well as deep sea fishing boats and other marine vessels. Whangarei is one of only four deep water ports in New Zealand, along with Devonport in the North Island and Lyttleton and Nelson in the South Island. Our lowest ever depth is 4-6 metres and we regularly work on ships whose draft is between 1 and 6 metres. These include commercial fishing vessels, ferries, steel hull yachts and other working boats. At Ship Repair we stand behind our workmanship and our promise to help you get your ship together as quickly as possible without compromising on standards. The facilities at Ship Repair comprise a 2000 tonne capacity slipway as well as a second 40 tonne slipway. We have the necessary equipment and crew to attend to hull repairs on larger vessels or two smaller vessels at once in the main slipway, allowing for faster turnaround times. Ship Repair has a sheltered commercial wharf with berths of 120m, 67m and 36m, complete with crane. There is no swell in bad weather to disrupt hull repairs and maintenance work. Other facilities include onsite engineering workshops for machining, welding and fabrication work.24-hour onsite security, and fully serviced offices for ship owners’ use. Ship Repair can also custom make and fit refrigeration coils for tuna boats. 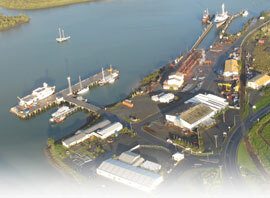 Only minutes from the full range of amenities in the CBD and Whangarei’s commercial wharf district, the marine industry is well catered to at Ship Repair Whangarei.